Monument to Stalinist repressions to be transformed into museum about penal system as NGO ousted after battle with regional officials over site’s preservation. A museum dedicated to the victims of Soviet-era repression is being re-designated and the NGO that manages it is to dissolve following an ongoing dispute between museum staff and regional authorities. The Perm-36 Memorial Center of the History of Political Repression, built on the site of a Soviet-era labor camp, announced on March 2 that it was to cease its activities. “More than twenty years ago our public organization with assistance of administration and the government of the Perm Territory began the preservation of a unique complex of camp constructions of GULAG era,” read a statement on the website of Perm-36, the non-governmental organization (NGO) that had overseen the administration of the museum. In 2012, however, according to the statement, the attitude of the authorities towards the museum “changed drastically.” The museum saw financing of restoration work completely cut off, along with a campaign to include Perm-36 on the World Heritage UNESCO list and a development program for the museum. “All attempts of negotiations with the Perm administration over the preservation of Perm-36 as a real museum of political repression in Soviet history and as a unique historical monument have turned out to be useless,” read the statement. Founded in 1994, the museum encompasses the huge territory of a former penal colony in the Perm Territory (800 miles east of Moscow), where from 1946 onward those convicted of “dangerous state crimes” served out their sentences. 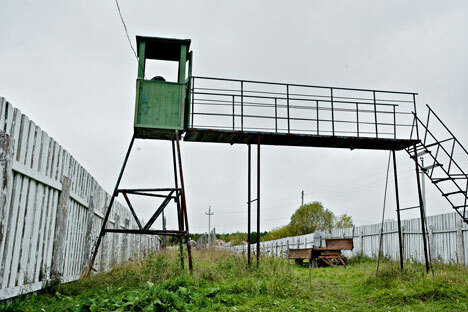 Since it opened, the museum has overseen the almost complete reconstruction of the Stalin-era labor camp that it occupies. However, in 2014 the authorities of the Perm Territory decided to create a new state museum on the premises of Perm-36, bringing them into conflict with the museum’s staff, who opposed the redesignation of Perm-36 as a museum to the state penal system instead of to the victims of Stalinist repression. The leadership of the museum, Viktor Shmirov and Tatyana Kursina, were fired in May 2014, to be replaced by an official from the Perm Ministry of Culture, Natalya Semakova, who had no prior relationship to the museum. In July 2014, after a series of unsuccessful attempts to restore the status quo, the Perm-36 non-governmental organization officially announced its termination of cooperation with the museum. Officials from the Perm Territory administration have repeatedly declared that they are ready to develop the museum even without the aid of those who founded it and worked on the creation of its exhibitions, the Interfax news agency reported. This article is based on reporting from RBC and Interfax.